Memphis, Tennessee � According to a recent study by the Propane Education and Research Council (PERC), more Americans now recognize the importance of spending quality time at home, both inside and out. As a result, outdoor living spaces, such as patios and decks, are becoming increasingly popular places for family and friends to gather together. These outdoor experiences can now be extended into the colder months through the use of outdoor patio heaters. BackyardCity.com, a successful Internet retailer of outdoors products, began carrying outdoor patio heaters on October 1st this year, in response to increasing demand for merchandise that provides comfortable outdoor conditions. The new lineup currently includes models from Arctic Products and Dayva, with more soon to follow. 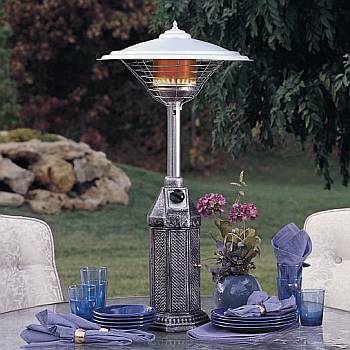 Their full list of outdoor patio heaters can be viewed on their website at http://www.backyardcity.com/Heaters/. Homeowners are not the only ones benefiting from outdoor patio heaters; BackyardCity.com also carries highly efficient commercial grade heaters. Restaurants, bistros, caf�s, pubs, caterers, and others can thus keep outdoor areas useful and productive throughout colder seasons. �I'm excited about our new line of patio heaters,� said Trey Collier, president and owner of BackyardCity.com. �Patio heaters are fashionable, easy to use, and safe. Best of all, they allow people to enjoy the outdoors longer.� Collier also commented that the company�s next addition to their merchandise will be a line of outdoor fireplaces and chimneys. Since 2001, BackyardCity.com has been selling high quality outdoors products, such as pool equipment, outdoor lighting, and patio furniture, to individuals and businesses in the USA and Canada. The company, based in Memphis, Tennessee, continues to grow and expand each year.